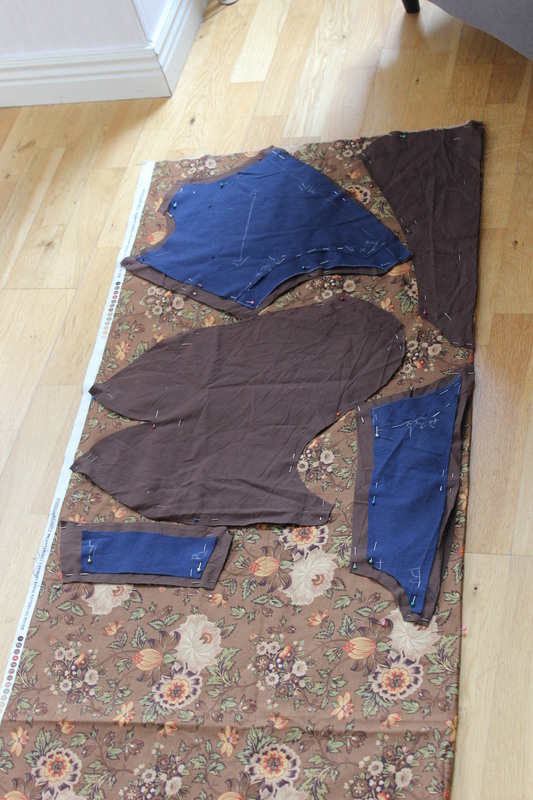 I thought it is about time to give you an update on my sewing game against my boyfriend (Sport Vs Sewing). 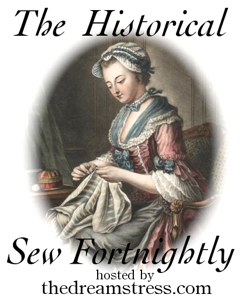 Well I need to confess – I have had no chanse in hell, to stand up to his television sports with my sewing. 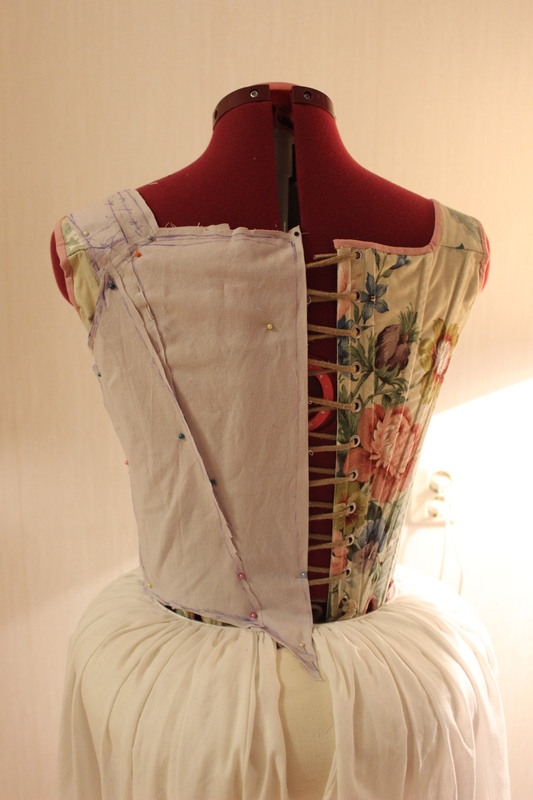 First I had the big Opera 1880s gown to finish in january, making me decide to post-pone the game a month, to february – which turned out to be even more filled with sport (Olympic games anyone). And between some comissions and the HSF14 I really stuggeled to get enything done on the “Sports Anglaise”. 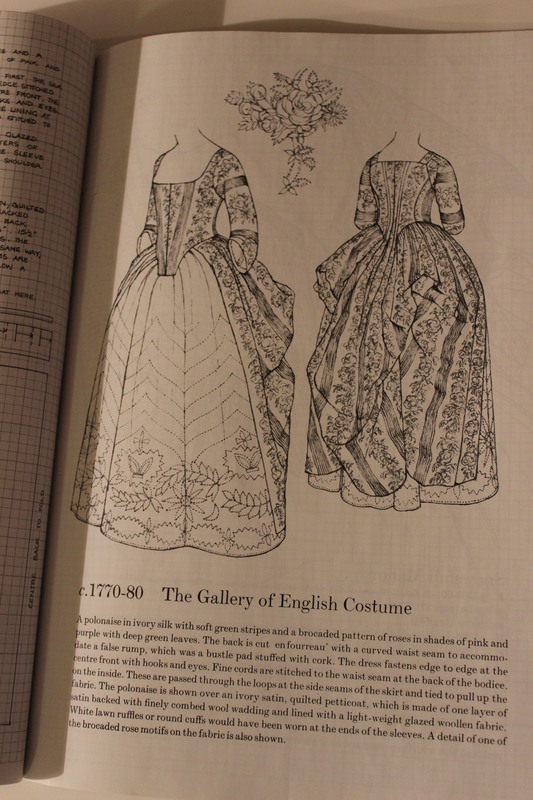 For my gaming entry I’ve decided to make the 1770-1780s Robe Anglaise from Janet Arnolds “Pattern of Fashion”. 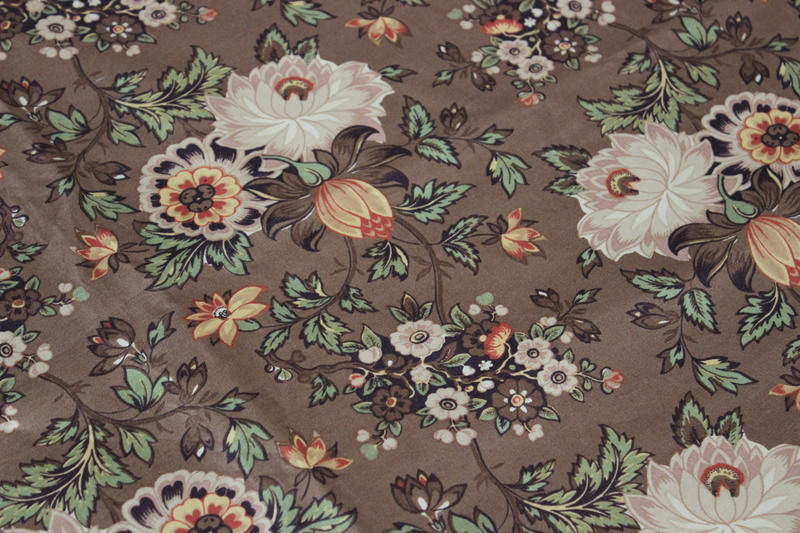 The fabric is a lowely flowery quilting cotton I bought (the whole bolt) on sale this past fall. So while the Olympics hockey games played on our television I finaly grabbed myself and got to work. 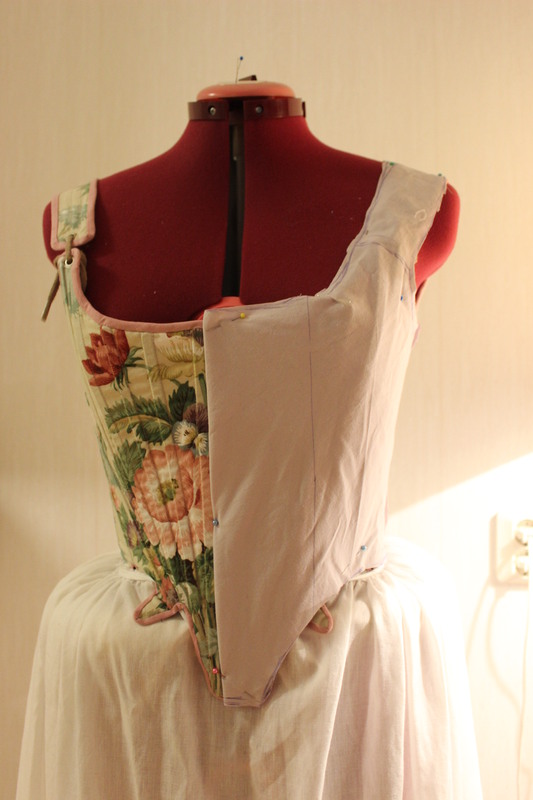 Putting my 18th century corset, bumroll and petticoat on my dressform, I started to drape a pattern. Here you can see the different lines and changes I made while working. 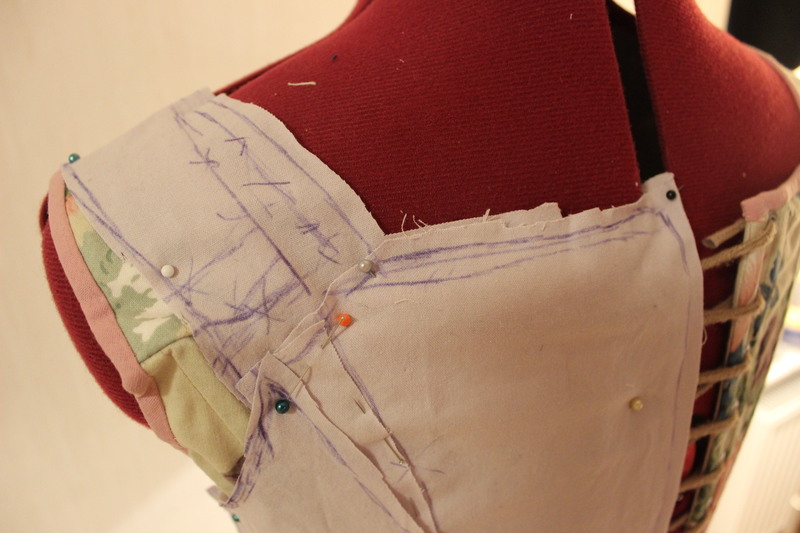 Trying to get Arnolds pattern sketch to match the lines and shapes on my dressform. 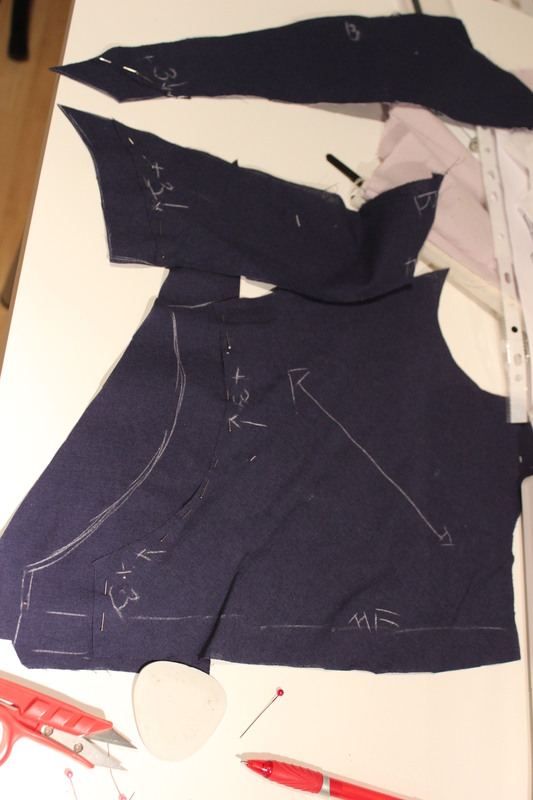 When satisfied I un-pinned the pattern from the form, and re-drew and cleaned up the lines and curves to get a nice looking pattern. 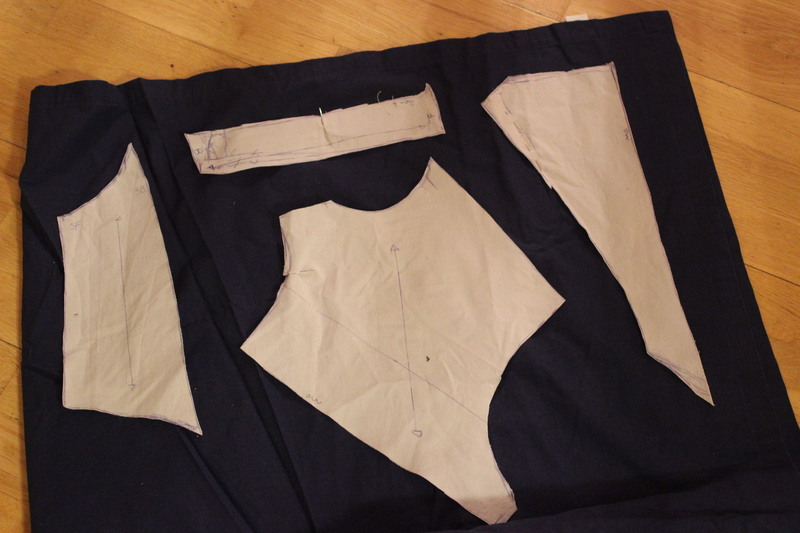 Then I cut the bodice in regular cotton lawn for the mock-up. As usual it needed some changes. 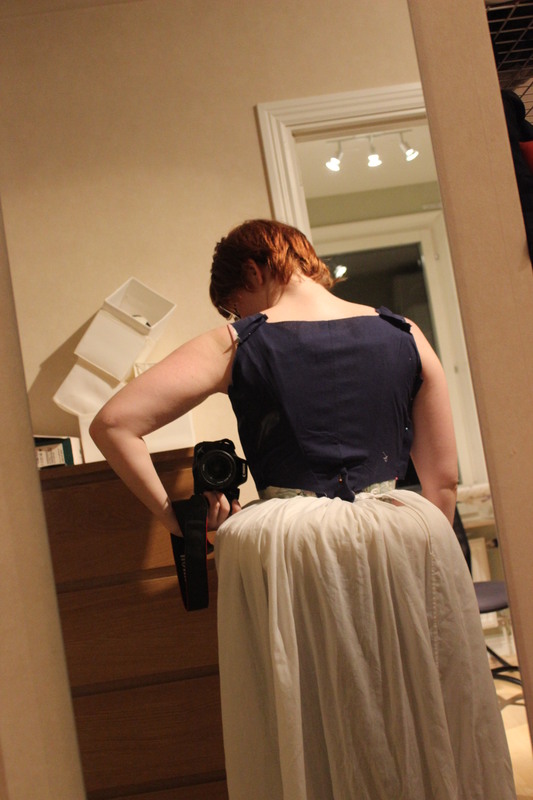 Like taking out about 6cm in the shoulder straps, and adding about 3 cm in lenght to the waist. 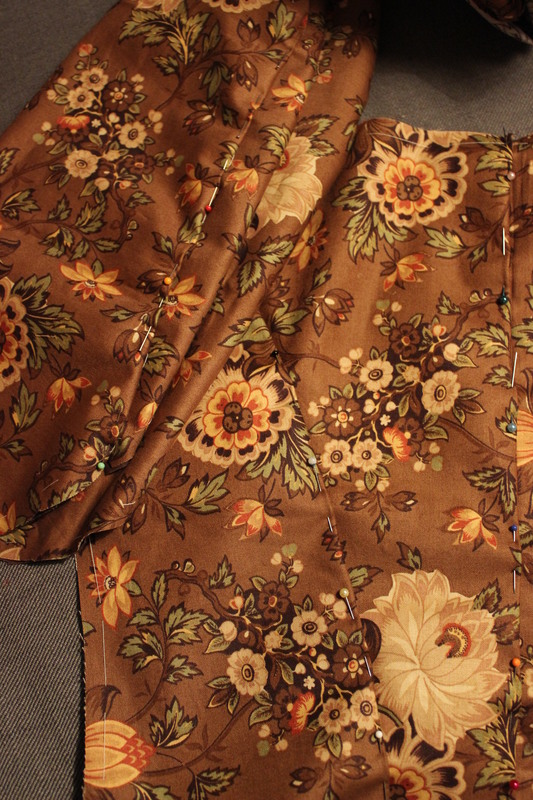 I also needed to re-adjust the center back seam to get a nice and smooth line. 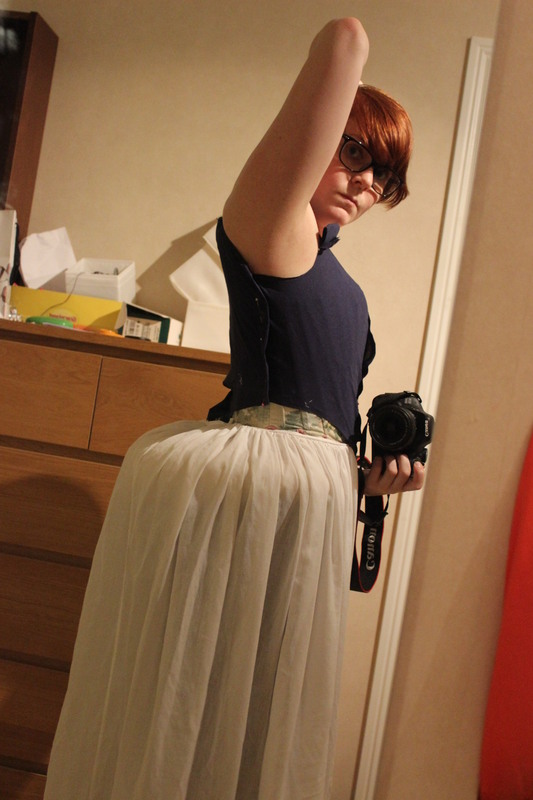 Making the changes to the mock-up. 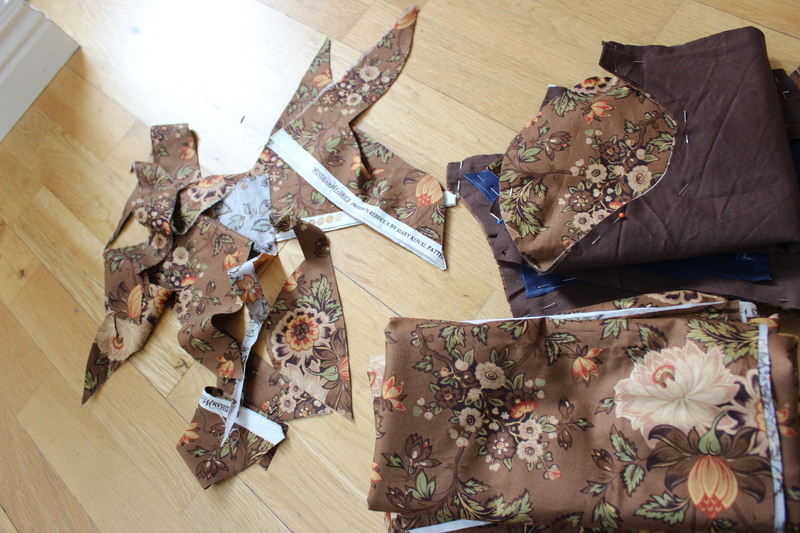 Then I lay the pieces out and pinned them to the fabric. 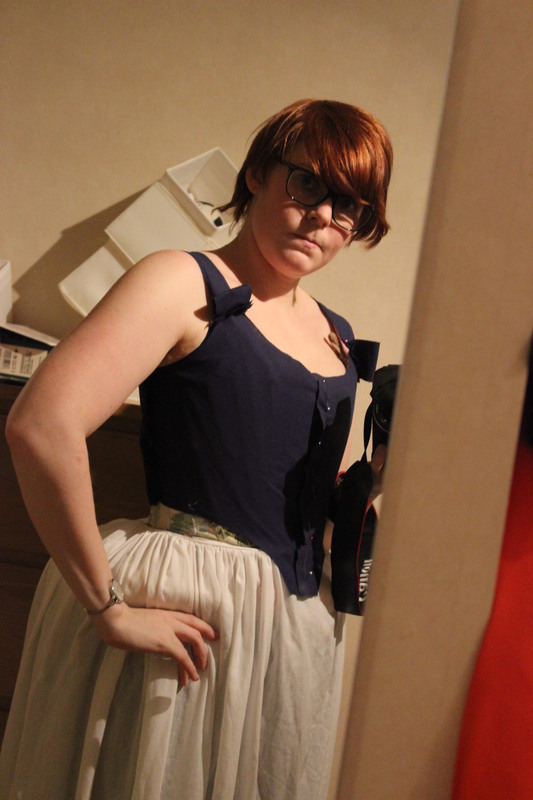 I was both impresed and a bit worried by the smal amounth of fabric scraps left after cutting the bodice, sleeves and skirt pannels. There will be no room for mistakes. 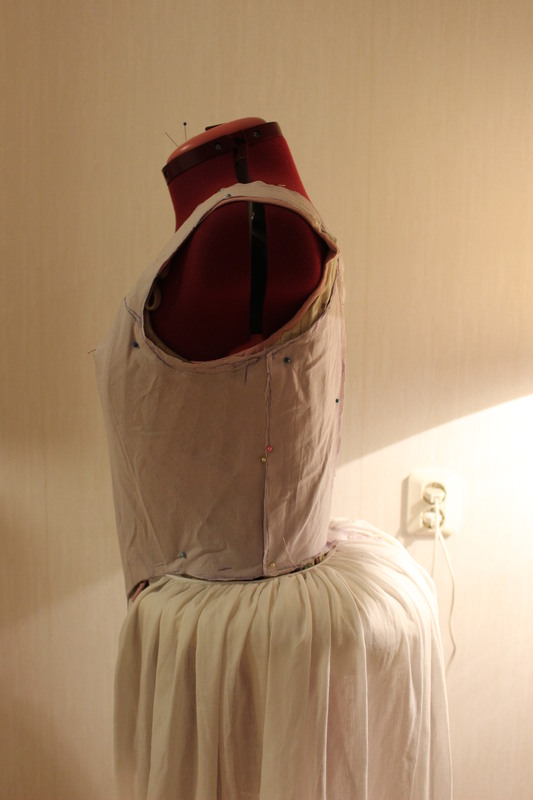 The last thing I did (during the disapointing hockey finaly) was to pin the pieces togheter, thous making them ready for hours of hand sewing. 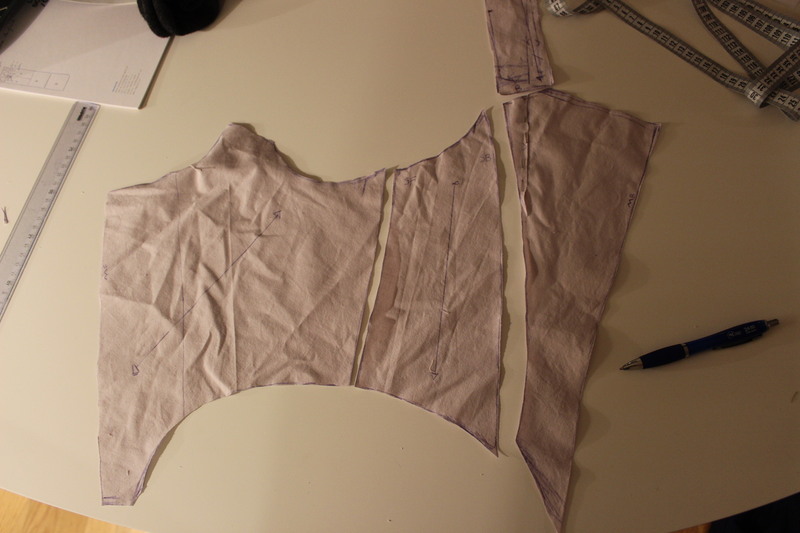 Tally: 2 hockey games = draping a pattern, making a mock-up, cutting the fabric and pinning the pieces togheter.